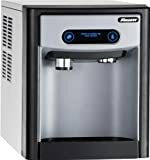 Our countertop Follett ice machine review will take you through a brief product description of the item, detail its most prominent features, instruct you in how to use it, provide with user opinions, and give you a list of the good and the bad. Because this is a professional-grade model that produces a lot of ice, we recommend it for businesses rather than personal use. This Follett countertop ice machine represents a pinnacle of ice-making technology. It produces a large amount of ice during each operating cycle, has a durable body, is simple to operate, and makes efficient use of space. This countertop model from Follett won’t take up a lot of space with its dimensions of 17.59 x 14.62 x 22.12 inches. However, note that unlike some other countertop ice makers on the market, the countertop Follett ice maker is not a portable model. It weighs 90 pounds when empty. This means we can recommend it for those who want to place an ice machine in the ideal location and leave it there. The stainless steel exterior is sleek, attractive, and easy to maintain. Follett uses a variety of professional-grade parts for the internal mechanisms of this ice maker. These parts increase the cost of the machine but make it a good choice for businesses. Recommended for: The countertop Follett ice machine can produce up to 125 pounds of ice in a single cycle and store seven pounds of ice for later use. Its dispensing mechanism can serve 25 people. While this ice maker could perform admirably in a large party setting, it is not meant for home or personal use. We can recommend this item to restaurant owners or other businesses that need to serve a lot of ice for commercial purposes. This section of our countertop Follett ice machine review will provide some details on the machine’s basic features. The list may not include every feature the item has in store for you. Nonetheless, it represents some of its most useful aspects that we discovered during our review process. The countertop Follett ice machine is capable of producing up to 125 pounds of ice in one cycle. Each cycle lasts for 24 hours. The amount of ice you can get with this product makes it a great choice for any location or business that deals with huge parties on a regular basis. You can store up to seven pounds of ice at a time using this machine. Its storage space will keep the ice cold for a long time. The unit includes a water dispenser with antimicrobial protection to ensure that all your ice is pure. You have access to push-button controls that are easy to operate. This ice machine features a drainless design that should make it easy to maintain or clean. It includes a large water storage reservoir to ensure that it can make a full load of ice during its operating cycle. The countertop Follett ice machine comes with a standard two-year warranty. This warranty covers all of its professional-grade parts and the cost of any labor you might need to hire to fix the machine. It runs on R-134a refrigerant and should be able to operate adequately even in temperatures up to 90 degrees Fahrenheit. Before we get into how to the unit works, we recommend that you pick an ideal spot for your countertop Follett ice machine. It won’t take up much space, but it is not portable. It would be difficult to move it after you’ve installed it. Once you’ve plugged the machine into the appropriate wall outlet, you’ll just need to fill its reservoir with water and check the settings on the control panel. Since the countertop Follett ice machine is able to produce so much ice, it may need several minutes to warm up before it is ready to begin making cubes. There’s no need to worry if the unit needs more time than you’re used to before it starts ramping up production. Follett has designed this machine to produce specific types of purified ice or water as needed. Most people that make use of the countertop Follett ice machine are not individuals with everyday needs. The machine excels at producing a lot of ice for a commercial business that needs several pounds of it on a daily basis. In some cases, medical institutions that need ice have found that this machine works well. It is relatively quiet for such a large machine, and you shouldn’t really notice it among the background noise you’ll hear in most commercial settings. In rare cases, some users experienced trouble with the compressor or some of the other parts. Nonetheless, everything inside the machine gets excellent warranty coverage should something break or malfunction. This ice machine is in a different class from some of the personal models you might know. Although it can be an expensive item, we think the countertop Follett ice machine pays for itself with outstanding ice production and storage capacities. This item is certified by ETL, a nationally recognized testing agency. You can use it for a commercial business. The countertop Follett ice machine can store seven pounds of ice for later use. You can use it to make 125 pounds of ice per day. It should be more than enough to fill the needs of a large group of people. Most of the parts are under a two-year warranty, and the compressor is covered for five years. It can be expensive for individuals or small businesses. You can’t transport it easily. If you are a business owner or otherwise need a high-capacity ice maker for commercial use, the countertop Follett ice machine is a great choice. You won’t have to worry about running out of ice and you can store some for later. Please feel free to share your opinions on this particular model with us in our comments section.